Jason Simpkins writes: Everyone knows that China's economy is hot. The only question is whether it may be a little too hot. China posted yet another quarter of stellar economic growth in the first quarter of 2011, with its gross domestic product (GDP) growing 9.7%. However, analysts are worried about some of the side effects that have accompanied that growth- namely soaring inflation and the emergence of speculative bubbles. Inflation in China hit a 32-month high in March, and the country's real estate market is beyond scorching. Policymakers in Beijing insist they have the situation under control, and they've been trying to rein in liquidity and curb speculation to prove it. That's why China's economy, accustomed to double-digit growth, is only expected to grow 8% to 9% this year. Of course, while China may be experiencing some acute growing pains, its economy regressed the least in the wake of the global financial crisis - and it will continue to operate as the engine of global economic growth going forward, even if the United States relapses into recession. In fact, China's GDP will rise from $11.2 trillion in 2011 to $19 trillion in 2016, while the U.S. economy will increase from $15.2 trillion to $18.8 trillion, according to the International Monetary Fund (IMF). That means in five years China will have supplanted the United States as the world's No. 1 economy. China's share of the global economy will ascend from 14% to 18% in that time, while the United States' share will descend to 17.7%. 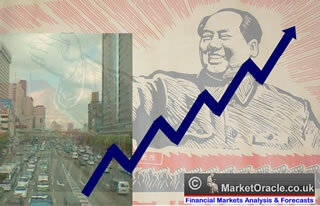 The rise of China's economy - now the world's second largest - has been meteoric. But the time has come for the country to evolve from a source of cheap labor and manufacturing to a fully developed economic power with a consumer class that's capable of sustaining domestic growth. China already has made some remarkable progress in rebalancing its economy. The country's trade surplus is narrowing and wages are on the rise. The central government is targeting an increase in minimum wages of 13% a year through 2015. Additionally, Chinese Premier Wen Jiabao aims to increase per capita household income by 7% a year in real terms during that period. He's also pledged to improve the social security and healthcare systems to help low-income households and to raise the personal income tax threshold - all in an effort to give the country's 1.3 billion people more spending power. "We will ensure that people's income increases keep pace with economic growth and people's salary growth keeps pace with the productivity rise," Wen said last month in an online chat with the Chinese public. China's 31 provinces boosted minimum wages by an average of 24% last year, according to Yin Weimin, China's minister of human resources and social security. Meanwhile, the average monthly income for migrant workers rose 13% to $256.89 (1,690 yuan). Six provinces have already raised minimum wages this year, with labor shortages and government mandates likely to compel the remaining 25 to follow suit. Rising wages have directly translated to an increase in retail sales, which rose 16.3% to $657.29 billion (4.2922 trillion yuan) in the first quarter, according to the National Bureau of Statistics. Sales in March rose 17.4% from a year earlier, and edged up 1.34% from February. "China is trying to rebalance its economy to become more consumer oriented. Wages are rising. People are earning more and will shop more, and that's good news for Chinese retailers," Andrew Sullivan, Director of Institutional Sales Trading at OSK Securities in Hong Kong, told CNBC. Shockingly, the country that for so long has been infamous for its thriftiness has become the world's largest market for luxury goods. As of December 2010, sales of luxury goods in China rose to $10.7 billion, or 30% of total global sales, up from $9.4 billion in 2009, according to the World Luxury Association (WLA). Luxury brands like Coach Inc.(NYSE: COH), LVMH Moet Hennessey Louis Vuitton SA (PINK: LVMHF), Burberry Group PLC (PINK: BURBY), and Hermes International SCA (PINK: HESAF) have all benefited from China's splurging. Coach last week reported a better-than-expected 18% increase in fiscal third-quarter profit, thanks largely to China. China revenue currently totals about $185 million and continues to increase by double-digit percentages, the company said. Rolls Royce saw its China sales rise 600% last year, putting it above Britain as the company's second-biggest customer behind the United States. China's luxury car sales are expected to rise to more than 909,900 units this year, up from about 727,200 last year, according to forecasts by IHS Automotive. And that number could climb to 1.6 million by 2015. China is already the world's largest auto market, with 18 million units sold last year. That figure is expected to grow to 23 million by 2015. As further testament to China's newfound consumer wealth, the GroupM Knowledge-Hurun Wealth Report 2011 showed the number of millionaires on the mainland is up 9.7% from a year ago. And the country has 115 billionaires according to Forbes magazine's 2011 list -- second only to the United States. Indeed, China's domestic consumption has shown the rapid growth that has become the country's trademark. But more importantly, it's advanced the central government's goal of a more balanced economy by helping to reduce the nation's disproportionate trade surplus. China in March posted its first trade deficit - about $1 billion - since 2004. Strong demand for imported consumer goods and higher prices for commodities drove the value of China's imports to $152 billion in March. The value of China's imports hit a record high of more than $400 billion in the first three months of the year. Last year, China ran a trade surplus of about $15.25 billion a month. However, 2010 also was the second consecutive year in which the trade surplus shrank, falling 6.4% from 2009 to $183.1 billion. The State Information Center forecast China's imports to rise 20% in 2011, while exports will increase by 16%. That would trim the trade surplus by 13.2%. China wants to double its imports by 2015, reducing the trade surplus to zero and emancipating itself from an export-reliant economy. Of course, China's rapid transformation has not gone off without a hitch. Inflation remains uncomfortably high, and there are fears of a growing bubble in the nation's red-hot property market. The most recent consumer price index showed inflation rising at 5.4% in March, the fastest pace in three years. China's inflation rate will likely rise above 5.5% in June, a team of economists at Bank of America-Merrill Lynch said in a report yesterday (Wednesday). However, that's likely to be the peak as Chinese policymakers are working overtime to stifle inflation at the expense of growth. The People's Bank of China (PBOC) has raised the benchmark interest rate four times- an increase of 100 basis points - and the reserve requirement seven times since October. "Stabilizing prices and managing inflation expectations are critical," the PBOC said in a first-quarter monetary policy report published yesterday. Still, China's economy is overheating because capital is flowing into the mainland faster than it is flowing out. China's foreign exchange reserves, having increased by $197 billion in the first three months of the year, now exceed $3 trillion. Indeed, huge trade surpluses and the large-scale purchases of U.S. Treasuries - which China makes to suppress the yuan's value - have resulted in a 17-fold increase in the country's reserves over the past decade. For every dollar that goes into China's reserves, the country prints 6.5 yuan. Furthermore, lending and money supply in the country continue to grow faster than expected. China's top four state-owned banks dispersed $40.1 billion (260.6 billion yuan) in new loans in April, slightly higher than the $37.3 billion (242 billion yuan) issued in March, according to local financial news provider Caixin. This is despite the fact that China's biggest banks are required to keep 20% of their deposits on hand as reserves. "What China calls ‘total social financing' - conventional bank loans and most other external sources of finance - was still 38% of GDP in the first quarter of 2011, almost as high as in 2009 when China implemented a credit-centric stimulus program," UBS AG (NYSE: UBS) economist Robert Magnus said in a column in the Financial Times. "The credit intensity of growth, or the amount of new credit generated for each unit of GDP growth, has risen from 1-1.3 before 2009 to 4.3 in 2011." Many of the new loans are going into China's property market, which is accelerating at a dangerous pace. The value of homes sold in the first quarter increased to $132 billion (860.7 billion yuan), the Statistics Bureau said last month, driving overall property transactions 27% higher to $157 billion (1.02 trillion yuan). The total value of homes sold in March alone rose to $63.7 billion (414 billion yuan), which is close to the total of the first two months of this year combined. New home construction rose 20% in the first quarter to 310.2 million square meters (3.34 billion square feet), the statistics bureau said. Overall investment in China's real estate rose 34% to $136.4 billion (885 billion yuan) in the first quarter, according to the government data. Startlingly, these figures suggest that Beijing's attempts to cool the property market so far have been ineffective. "While these growth rates are below ones seen in early 2010, they remain high relative to what developers are reporting and what the policy tightening would have suggested," Citigroup Inc. (NYSE: C) analysts said in a report. "We see this as a sign that the tightening probably has not yet been fully implemented at the local level." A rising number of institutions are growing concerned about China's real estate market. Even China Citic Bank Corp. Ltd. (OTC: CHCJY), the seventh-largest Chinese lender by assets, said yesterday that the country's property market has become too risky and it plans to cut lending to the sector. "Citic Bank relatively clearly sees that real estate risk this year is severe," Shi Yuan, the general manager of the bank's risk management section, said on a quarterly teleconference. "We especially are paying attention to risks in the funding chain for developers. We believe as tightening continuously gets stronger, the true real estate risks will appear." Still, it's important to remember that while bubbles may be forming - especially in the property market - the overall trend of China's growth is positive. "Yes there are probably pockets of bubbles in China and in the real estate market, but against that backdrop you have 500 million people expected to move into Chinese cities by 2020. That means the number of people expected to move into cities is almost double the population of the United States," said Money Morning Chief Investment Strategest Keith Fitz-Gerald. "So in the context of China's explosive growth, what we're looking at are some moderate setbacks over an extended period of high growth." Indeed, China is a growth story too compelling to pass up. However, investors should focus on parts of the Chinese economy more stable than the real estate sector. That means playing trends like consumption. The Claymore/Alpha Shares China Small Cap ETF (NYSE: HAO) has a large percentage of its holdings in consumer-focused firms. Consumer staples and consumer discretionary sectors represent 9.3% and 15.8%, respectively, of the fund's holdings. You might also consider large U.S. multinationals that have a sizeable footprint in China. These companies continue to benefit from China's fast-growing consumer class and are less susceptible to potential setbacks. McDonald's Corp. (NYSE: MCD) and Yum! Brands Inc. (NYSE: YUM) are two food operators profiting from China's growing consumerism. Additionally, the revamped General Motors Co. (NYSE: GM) has a very strong presence in China. GM is expected to retake the crown for most global auto sales from Toyota Motor Corp. (NYSE ADR: TM), which has been devastated by the recent disasters in Japan. The company intends to introduce more than 60 new or upgraded models for the Chinese market and aims to double sales to around 5 million units by 2015. There's also China Yuchai International Ltd. (NYSE: CYD), which manufactures and sells diesel engines - most of which are distributed in China. As mentioned earlier, luxury sales in China continue to rise as well. That stands to benefit luxury brands like Coach Inc. (NYSE: COH), Burberry Group PLC (PINK: BURBY), and Compagnie Finciere Richemont (PINK: CFRUY). Finally, Money Morning's Fitz-Gerald likes the Morgan Stanley China A Shares Fund (NYSE: CAF). "I particularly like CAF because small business ventures in China have the most to gain and most of those companies are traded only in China A shares," said Fitz-Gerald. "And CAF is the only fund that gives U.S. investors ‘direct access' to the A-shares." CAF is one of the best ways to profit from China's shifting growth model. A recent portfolio allocation of the fund showed 28% of its holdings were in consumer goods and services, 26% were in financials and 18% were in basic materials. CAF also holds shares in companies that make auto components and beverages, among other products, and has numerous stocks in the metals and mining sectors. Where did you get that crazy China GDP number for 2011? China is building massive empty cities that no one lives in and selling unreal quantities of real goods to Americans in exchange for worthless dollars. How could this possibly end badly?! ?